The broad end-use areas of sulfur dioxide are chemical, textiles, and food and beverages. Of these, the chemicals segment led in 2015. 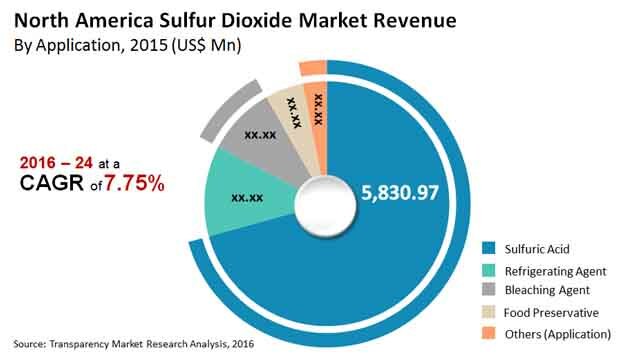 However, the food and beverages sector is expected to gain large growth momentum in the North America sulfur dioxide market during the assessment period. The substantial uptake of sulfur dioxide for the end-use industry is accentuating the growth of the segment. The study presented here is based on a report by Transparency Market Research (TMR) titled “Sulfur Dioxide Market (Application - Sulfuric Acid, Bleaching Agent, Refrigerating Agent, and Food Preservative; End Use - Chemical, Textiles, and Food & Beverages) - North America Industry Analysis, Size, Share, Growth, Trends, and Forecast 2016–2024”.